Which Is Better : The Polarized or The Photochromic Lens? Home » Info » Which Is Better : The Polarized or The Photochromic Lens? On many occasions, we ask ourselves which is better the polarized lens or the photochromic lens, and the answer is very easy, it depends on what we are going to use the glasses. A sports sunglasses can carry multiple options of lenses, and it is not that some are better than others, but each one is more recommended than the others for a particular sports discipline because it helps us improve our visual performance in that sport particularly. The polarized lens helps eliminate the reflections produced by sunlight on surfaces such as water, snow, asphalt, etc. And occurs because sunlight vibrates in all directions and when it bounces on these types of smooth surfaces, causes uncomfortable reflexes, especially in driving situations and water sports and/or mountain. The Polarized lenses, however, contain a special lens that blocks reflected light and only let the useful light, allowing many more comfortable vision without reflections. The photochromic lenses instead incorporated in their mass components that react to sunlight darkening and absorbing solar radiation and clearing when the radiation stops impinging on the lens.These are lenses that adapt to the UV radiation of the environment, darkening proportionally to the ultraviolet they receive. That is, in low light conditions, on covered days or in closed environments with artificial light, the lenses are transparent, but with sunlight, they get darker. They are usually gray or brown. Photochromic lens category 0-2: The maximum level of clearing is 0, which would be equivalent to a transparent lens, and the maximum level of darkening is 2. We can find them in gray or brown, mainly. Lens indicated for low light conditions or cloudy days. Photochromic lens category 0-3: The maximum level of clearing is 0, which would be equivalent to a transparent lens, and the maximum level of darkening is 3. We can find them in gray or brown, mainly. Lens indicated for low light conditions or cloudy days, as well as days of intense sun. Photochromic lens category 1-3: The maximum level of clearing is 1, which would be equivalent to a semi-transparent lens with a certain degree of residual color, and the maximum level of darkening is 3. We can find them in gray or brown, mainly. Lens indicated for medium light conditions at days of intense sunlight. Photochromic lens category 2-4: The maximum level of clearing is 2, which would be equivalent to a lens with a certain degree of residual color, and the maximum level of darkening is 4. Normally we find them in the brown tone. Lens indicated mainly for high mountain or sunny days. When will we use polarized or photochromic lenses? 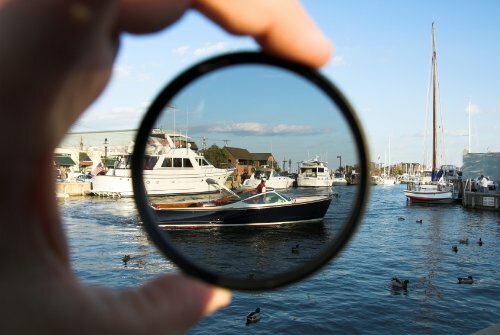 If we are going to practice water sports, cycling or skiing, the ideal is that the lens is polarized. If we are going to practice this sport mainly during the day, as they are outdoor sports in which we are exposed to the sun, it is not essential that the lens is also photochromic. Moreover, if we want to go out with the bike indistinctly both during the day in the full light and at the first or last hour of the afternoon, the ideal is that in addition to being polarized they are photochromatic. If the sport we are going to practice is not in contact with water, asphalt or snow, which are the surfaces that most reflect sunlight, it is not necessary for the lenses to be polarized. But if we are going to practice sports at any time of the day and both indoor and outdoor, we recommend that they be photochromic.